The time of the Diadochi has always been one of my favorite eras of history for reading and gaming. Forget Alexander; without the cast of generals he had around him, he might just be a footnote in history. Pyrrhus's life spans through the time of the Diadochi and Epigoni. As a youth he is fighting along side Antigonus and Demetrius in the largest battle of the Hellenistic period, Ipsus. Pyrrhus's life is definitely one that should have a movie made of it. His fortunes were always up and down, but his personal bravery and his generalship was never in question. Hannibal ranked him as either the greatest or second greatest general of the ancient world (Plutarch recounts both in different places). Left adrift at the age of two to the fortunes of war, his battles for his patrimony and conquest are the stuff of legends. Out of all the kings at the time, he was the one that most people considered to be a true successor to Alexander, who was actually his second cousin. Pyrrhus's uncle Alexander Molossus invaded Italy, and fought the Romans as his nephew later would. Livy has Alexander Molossus saying at his death "that he fought men, while his other nephew Alexander waged war against women". On to the actual book. First, the book has something that all history books should have, maps, and it has eight pages of them. Some people who read history have an innate map system that allows them to be able to see in their heads where everything being written about is, and actual battle placements. Others have to keep cross-referencing while reading, which is a bit of a hassle. History books, and especially military history books, should always have maps and the more the better. Mr. Champion starts the book with a background history of Epirus. The biography continues with Pyrrhus's exile, his return and then his short tenure of king of Macedon. During his fight for the crown of Macedon is where he gained his nickname 'the eagle'. 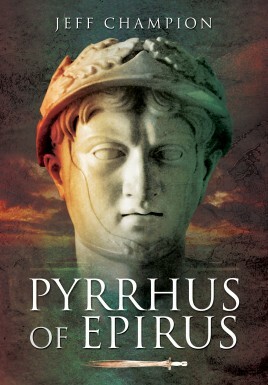 Then Pyrrhus's life enters the best known part, his invasion of Italy and battles against the Romans. Unlike Hannibal, the Romans were actually debating whether to submit to Pyrrhus. If not for the old blind man Appius Claudius Caecus, a peace treaty would have been signed between Rome and Pyrrhus. What changes would have occurred in the rest of history if this had happened? His life continues with many victories against Carthage in Sicily. He then becomes embroiled once more in fighting Rome and then returns to Greece where his life is cut short in Argos by an old women wielding a roof tile, of all things. Mr. Champion does a very good job of showing all of the different accounts of his battles and Pyrrhus's history in general. Where there are conflicting accounts, Mr. Champion makes sure the reader is aware of them. History, as we know, is usually written by the victors. So most of the accounts of Pyrrhus in his struggles with Rome do not make sense if he lost battles or his casualties were as high as some state. Well-written and stuffed full of history of not only the man, but also his time, this book is very easy to recommend. Thankfully we live in an age where there are historians who are finally filling the blank spots in the great Hellenistic age. We can only weep at the many histories that Plutarch, etc. mention that have until now never been found.